This baked tilapia is quick and easy to prepare, and the mild and delicious fillets bake in about 15 minutes. 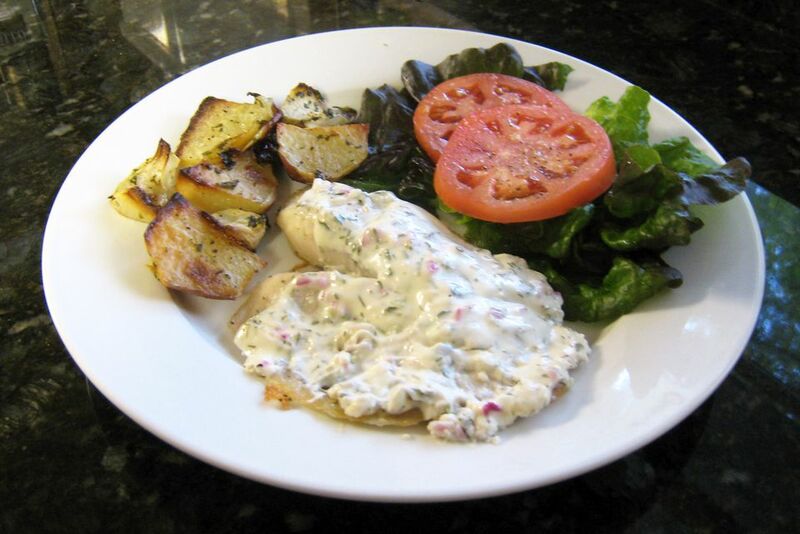 The sour cream sauce flavors the mild tilapia fillets perfectly. It's best with fresh dill and parsley, but you can substitute a teaspoon or two of dried dill in a pinch. Roasted potatoes are a nice side dish to serve with the tilapia, or serve the fish with rice and a side vegetable or salad. Allow about 4 to 6 ounces of tilapia per serving. Grease a 13x9-inch baking dish or a baking dish large enough to hold the tilapia in a single layer. Arrange the tilapia fillets in the baking dish; sprinkle with salt and pepper. In a bowl, combine the sour cream, mayonnaise, onion, dill, parsley, and lemon juice; spread the mixture evenly over the fish fillets. Bake for 12 to 15 minutes, or until fish is cooked through and flakes easily with a fork. To minimize a fishy odor, soak fillets in buttermilk for about 15 minutes, or soak it in a mixture of milk and lemon juice - about 1 teaspoon of lemon juice per cup of milk. Rubbing the fish with a little lemon juice or lime juice might also help. If you won't be serving the fish immediately, keep it warm in a preheated 200 F oven. "My husband told me this was, hands-down, the best fish dish I've ever served (and I've served dozens and dozens and dozens). Have made it three times in the last week and a half. Super yummy. Crispness of the onion, that dill flavor in the creaminess. Yep, yummy to the tummy." A.B. "I made this following the directions to a "t" and it turned out perfect! My husband and I will definitely make this again! " J.K.
"I generally hate fish but this was amazing. the red onion, sour cream and parsley were a great add-ons to make the recipe prefect." L.D.